…a three-issue miniseries from the mid-1990s nadir of the Chromium Age of Comics. Unlike the sequential art atrocities unfolding in other Marvel offerings at the time, Ultragirl was an attempt to return to a simpler age of superheroic melodrama devoid of cross-hatching and extreme over-accessorization. 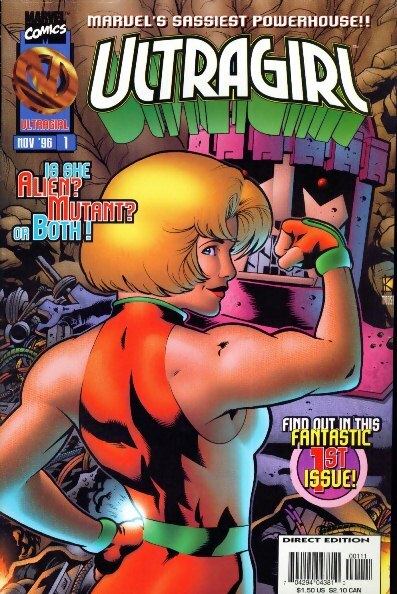 Ultragirl (or “Ultra Girl,” depending on the letterer’s whims) was Suzy Sherman, an aspiring actress who manifested the classic set of superpowers (flight, damage resistance, super strength) after one of her auditions was crashed by a rogue Sentinel. Knowing a good PR gimmick when she saw one, Suzy donned an improvised costume to fight a short-lived battle on behalf of truth, justice, and shameless self-promotion. 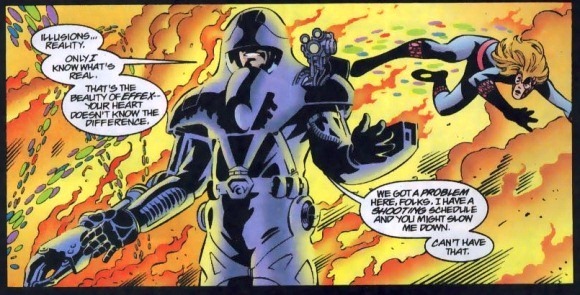 …and the revelation that she was actually some kind of mutant hybrid Kree warrior-messiah. While Ultragirl was a welcome change from the other drek Marvel was foisting on readers back in 1996, its merits in that regard are entirely relative. The overall concept and intent behind the project were solid — and prefigured the “back to basics” approach the publisher pursued in the wake of the “Heroes Return” event — the execution left a lot to be desired. Nearly everything about Ultragirl and her adventures came off as something cobbled together by a focus group from the previous decade’s YA fiction tropes. She’s blonde! She’s “sassy!” She has cool friends representing various (attractive) ethnic archetypes! She’s trying to find her place in the world while learning what really matters! It was edutainment minus the educational aspects — or Illuminator minus the hard sell for Team Jesus — and guaranteed to be utterly overshadowed in a retail environment swamped with luridly packaged crap. It’s hard to ridicule something that made a go of swimming against the demographic currents at a time when the manchild id ran rampant, but the comic was so damn generic that it should have come with a blank white cover stamped with “Good Intentions Predestined for the Quarter Bin” in blue across the top. It’s the type of project that entrenched members of the editorial boys’ club could point to and say “hey, we tried” whenever fan-agitation about greater diversity gets too loud to ignore. 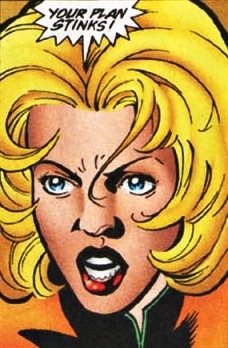 Suzy has since made appearances in some of Marvel’s more recent event books, including a short stint in the Initiative and a gig with the new New Warriors where she hooked up with Justice. I suppose that’s a better fate than getting decapitated by a rabies-infected Kite-Man (as per the rules for z-listers at the Distinguished Competition), but still hardly the stuff that elevates one from the backbenches of Nobody’s Favorites. I remember LOVING Ultragirl when it came out precisely because of it’s return to superhero soap opera antics and…well, there being something of a story set in the Marvel Universe that wasn’t tied to anything mutant or Onslaught. A few years ago I pulled the issues from a random longbox in my basement (yes, I’ve needed to store comics in a basement from time to time) when I “discovered” them once again after forgetting the character ever existed. It wasn’t until just now that I understood the reason WHY the shine had faded so much between my readings.